MonkeyChops™: Facelift April - Trapped! 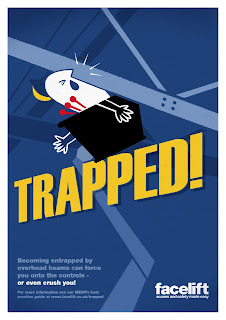 April's Facelift poster is Trapped! After a couple of months of relative safety, I thought it was time to place the character in a position of imminent death once again, and for Trapped, he has squished his face against the ceiling beams and fallen onto the controls, jamming him in place. The ceiling beams were drawn from life at the studio, as it's light industrial look was perfect - although getting the facial features of our poor man to look right involved using a mirror held at a ridiculous angle!